Louis Jude “Lou” Ferrigno is an American actor, fitness trainer/consultant, and retired professional bodybuilder. As a bodybuilder, Ferrigno won an IFBB Mr. America title and two consecutive IFBB Mr. Universe titles and appeared in the bodybuilding documentary “Pumping Iron”. 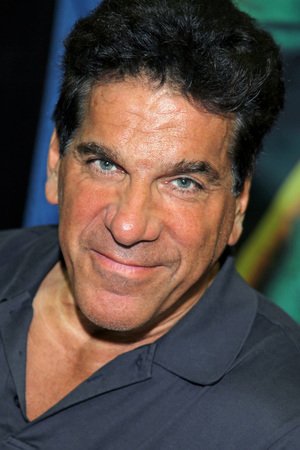 As an actor, he is best known for portraying the title role in the CBS television series “The Incredible Hulk”. He has also appeared in European-produced fantasy-adventures such as “Sinbad of the Seven Seas” and “Hercules”, and as himself in the sitcom “The King of Queens” and the 2009 comedy “I Love You, Man”. From Wikipedia, the free encyclopedia. Description above from the Wikipedia article Lou Ferrigno, licensed under CC-BY-SA, full list of contributors on Wikipedia. When Rumpelstiltskin destroys the Magic Mirror and escapes to the modern world, the four princesses of \Once Upon a Time\-Cinderella, Sleeping Beauty, Snow White, and Rapunzel-are sucked through the portal too. Well-trained and endowed with magical powers, the four women must fight Rumpelstiltskin and his army of thralls before he enslaves everyone on Earth. Peter Klaven is a successful real estate agent who, upon getting engaged to the woman of his dreams, Zooey, discovers, to his dismay and chagrin, that he has no male friend close enough to serve as his Best Man. Peter immediately sets out to rectify the situation, embarking on a series of bizarre and awkward \man-dates,\ before meeting Sydney Fife. Explosive, action-packed adventure unfolds as one of the all-time most popular superhero sagas continues the world's most primal force of fury: The Incredible Hulk Academy Award-nominee Edward Norton assumes the iconic role of scientist Bruce Banner, who is living in the shadows, scouring the planet in search of an antidote to his...temper problems. But the warmongers who dream of abusing his powers are in hot pursuit and soon embroil him in a battle of epic proportions that could leave New York City in ruins! Liv Tyler also stars as Betty Ross, the only woman the Hulk has ever loved. Directed by Louis Leterrier. The classic Marvel comics character comes to life in Academy Award winner Ang Lee's epic vision. When scientist Bruce Banner is transformed into a giant, super-strong creature, he'll have to fight the forces of evil - while fighting the evil within himself. Great special effects and magnificant action scenes highlight this amazing adventure. Eric Bana stars with Academy Award winner Jennifer Connelly and Academy Award nominee Nick Nolte.